House Republicans are poised to move forward with a spending bill addressing one-quarter of the necessary segments to fund the federal government past October, even though the measure would trigger an across the-board sequester at the Defense Department. President Trump has indicated he would sign the “minibus” legislation, which, in addition to defense, would fund programs related to military construction and veterans affairs, energy and water development, and the legislative branch. The House is scheduled to vote on the 2018 Make America Secure Appropriations Act this week, despite a lack of a budget deal authorizing lawmakers to exceed spending caps currently in place. Democrats were quick to note the measure surpassed the limits spelled out in the 2011 Budget Control Act by $72 billion, which would trigger a 13.2 percent sequestration from all Defense accounts. That would mark the first actual revocation of funds since the 2011 Budget Control Act first went into effect in 2013, when agencies were forced to furlough employees and institute hiring freezes. In fiscal years 2014 through 2017, lawmakers struck bipartisan budget deals to alleviate the spending caps by offsetting the increases with other savings. Congressional negotiators have yet to unveil any such plan for fiscal 2018. Also controversially, the measure includes a provision to provide the Homeland Security Department with $1.6 billion for 60 miles of new fencing and 14 miles of secondary fencing along the U.S.-Mexico border. That provision alone will likely doom the measure with Democrats and in the Senate, where the bill will need 60 votes to pass. Democratic appropriators warned that their counterparts were “raising the threat of a disastrous Republican government shutdown” by failing to work on a bipartisan basis on raising caps on both defense and non-defense spending. Republicans have left a funding plan for non-defense agencies “with no path forward,” the Democrats said. 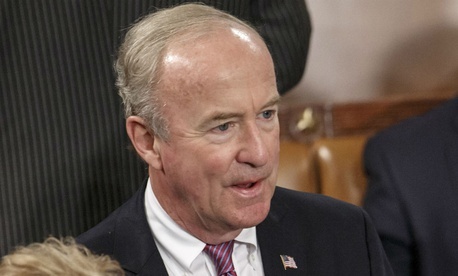 In a statement on the measure, House Appropriations Committee Chairman Rodney Frelinghuysen, R-N.J., did not address the spending cap issue. While the White House and Republicans in Congress have pushed for the increases in defense spending to be offset at non-defense agencies, such a strategy would require -- as noted by Justin Bogie, a senior policy analyst at the conservative-leaning Heritage Foundation -- legislation amending the framework of the BCA. “While Congress should take steps to increase defense spending, they should do so by making at least equal reductions to domestic spending programs,” Bogie suggested. When considering the $3.9 billion spending increase proposed in the spending bill for VA and inflationary adjustments, all other non-defense agencies would see their budgets reduced by $21.6 billion under the proposed House Republican Budget, according to left-leaning Center on Budget and Policy Priorities. In a Statement of Administration Policy, the Office of Management and Budget praised the defense increases and border fencing funding without commenting on the spending caps. OMB faulted lawmakers for failing to include Base Realignment and Closure authority, making some cuts at the Energy Department and other provisions not aligned with the White House’s priorities.